The creamy sauce of our Smokehouse Bacon Parmesan Menu Flavors is filled with the savory flavor of real bacon, making it a delicious compliment to our Smokehouse Bacon Chicken Carbonara. This Goat Cheese Tartlets appetizer recipe proves tiny foods can pack big flavor. Overflowing with cheese, eggs, and herbs you won’t believe so much goodness can come in such a small package. 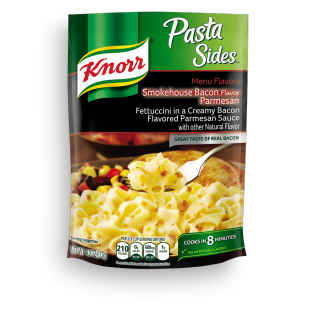 Smokehouse Bacon Parmesan Pasta is rated 2.5 out of 5 by 19. Rated 1 out of 5 by Iamsiaho from Tragically not good. Everything about this one says it should taste good... except the actual taste. In all honesty, I do not know what went wrong with this flavor, but it is, at best, underwhelming, and at worst, actually unpleasant. My one comment would be for people to NOT think my review is indicative of my view of Knorr as a whole. I really enjoy most Knorr sides, and I hate having to leave this review. My hope is that they see this, and other reviews, and do more in-house taste tests, especially comparing it to well received flavors, to see what changes are needed, to either change the flavor and make it better, or if this one should just be cut from the line up. Rated 5 out of 5 by cmm1234 from Great taste! I didn't hesitate to try this when I saw it in my store. And I was not disappointed. It is creamy, not overwhelming with the smoky taste and just the right touch of Parmesan. Rated 1 out of 5 by Chipred from To Much Smoke! This product was not what I was hoping it to be at all. The flavor was okay, at best, but the smell made it almost inedible. My kitchen currently reeks of fake smoke flavor smell. Knorr's side usually are pretty good, but I'd recommend steering clear of this one. Rated 1 out of 5 by Carebere from Horrible! I normally enjoy Knorr products but the taste is awful and doesn't thicken up. My children couldn't even eat it!